ICP, which is uniquely focused exclusively on ASX shareholder claims, and Litigation Lending, one of the pioneers of litigation funding in Australia, are investigating a potential shareholder class action, to be run by Shine Lawyers, on behalf of aggrieved IOOF investors who suffered losses from IOOF’s alleged non-disclosure of corporate misconduct, subject to the satisfactory completion of investigations into the alleged misconduct and sufficient interest from affected IOOF shareholders. On 20 June 2015, the Sydney Morning Herald published articles regarding alleged misconduct within IOOF. Details of the alleged misconduct identified by Fairfax Media included insider trading, front running and staff cheating over exams, occurring in the period 1995 to 2014. 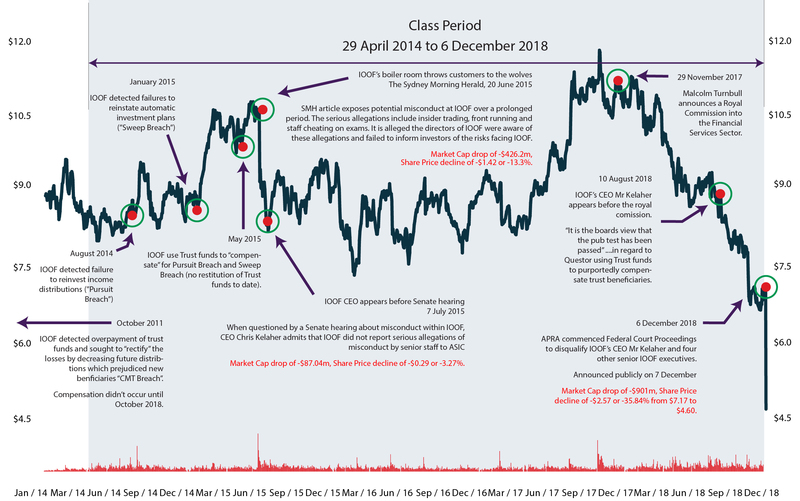 Following the Sydney Morning Herald articles, on 22 June 2015 IOOF’s share price experienced its largest ever single day fall to that point, closing down 13.3%, or $1.42. On 7 July and 3 August 2015, IOOF’s executives, including its managing director Chris Kelaher, appeared before a Senate hearing to respond to questions about the alleged corporate misconduct. On 7 July 2015, IOOF CEO Chris Kelaher admitted to the Senate hearing that IOOF had not reported serious past allegations of insider trading and front running by IOOF’s senior staff to ASIC. On the day of Mr Kelaher’s admissions to the Senate hearing IOOF’s share price dropped by another $0.29. In August 2018 Mr Kelaher and other IOOF executives were questioned again, this time by the Banking Royal Commission. During questioning it was revealed that IOOF’s Questor subsidiary had allegedly disadvantaged members of a super fund compared to private investors. Following Mr Kelaher’s appearance IOOF’s share price dropped by a further 6%. IOOF’s alleged failure to respond to concerns raised by APRA since at least 2015. Earlier this year we obtained a Federal Court order requiring IOOF to produce documents in relation to alleged misconduct. We have been reviewing these documents to determine whether a claim is to be filed. If you purchased IOOF shares between 29 April 2014 and 6 December 2018, please register your interest in the proposed class action.